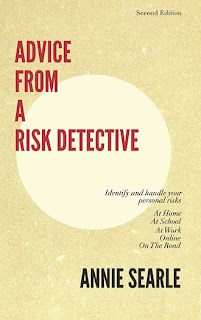 Advice From A Risk Detective: He was so young. I've only been teaching for five years, but have in that time never experienced the death of one of my students, particularly one that I continued to follow and mentor since he graduated in 2013. I find his loss devastating, and would like to tell you a little bit about him. Del Hazely was born in Sierra Leone, lived also in Gambia and came to the United States when he was eleven. He took his undergraduate degree at Penn State University in Information Technology and African and African-American Studies. He was a mid-career student in the University of Washington's iSchool Master of Science in Information Management (MSIM) program when I had him as a student. A paper he wrote for the "Ethics, Policy and Law in Information Management" course later was published in the Reflections on Risk II volume of research notes. It's called "Bridging the Digital Divide: The African Condition." After he graduated that year (2013), we kept in touch. I invited him to speak each year in that same class when the topic was the digital divide. He talked about more than the paper, though, and explained how he had kept his connection with Africa, investing both time and money in projects designed to reduce that digital divide. He had wit and passion in equal parts, and was respected by all who knew him and benefited from working with him. Del worked in the UW Police Department while he was pursuing the master's degree, eventually managing the entire IT operation. Since then, Chief John Vinson tapped Del to oversee the building of a new police station, starting with design and architecture, on through to completion. Last year, he tapped Del again, this time to become director of strategy & organizational excellence. There are no surprises here at all. Del was one of the most professional people I've met anytime in my career. With his understanding of both police work and technology, the sky would have been the limit. I saw him as a future chief of the Seattle Police Department, or even eventually if he wished it, as the head of a government agency like the National Security Agency (NSA). As an alumni, Del came back to the iSchool to work on our Curriculum Transformation Project, to include more diversity and inclusion into our courses. Our thoughts go out to his wife, Rose, and family, especially because of the unexpected nature of his death. He will be missed in this community, and back in Sierra Leone as well. He had only begun to make a difference in the world.